For the home, gallery, showroom, or any place you wish to add a subtle, underlying quality. MODERN INTERIOR FRAGRANCES MADE THOUGHTFULLY IN LOS ANGELES. Set the scene in seconds. The focus remains on your space, not the origin of the fragrance (like a candle or diffuser). The fragrances don't mimic the familiar, instead creating a subtle sense of intrigue and curiosity -- the key to a great interior fragrance. Unlike most personal perfumes that are designed to change over time, these fragrances remain linear, eliminating noise in the air. Over time the fragrance will settle in, and forever be linked to the memories created in your space. for your story to unfold. Undertone A comes in a 100mL glass bottle from Normandy’s Glass Vallée by Pochet du Courval, silkscreened with a dynamic line design. The bottle is filled to-order, by hand, in Los Angeles. Concentrated in the bottle, subtle in a room. Ingredients: SDA-40B Perfumer’s Alcohol and Fragrance. 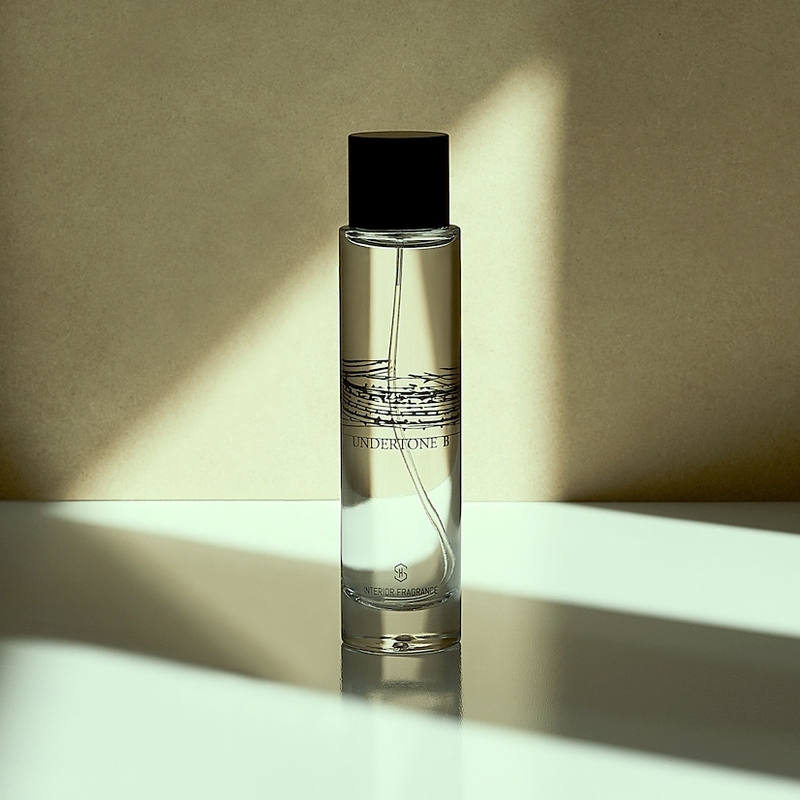 Undertone B comes in a 100mL glass spray bottle from Normandy’s Glass Vallée by Pochet du Courval, silkscreened with original artwork depicting sedimentary layers of Earth. The bottle is filled to-order, by hand, in Los Angeles. 1. A few sprays every few days. Into the center of a room, or closets and drawers. The alcohol immediately evaporates in the air, leaving only fragrance. For a more balanced distribution, spray areas that air moves: fans, vents, and air filters. You'll know how much is right for you in your space. Over time, the fragrance will settle in and become yours.